Practical Mom: 5 Good Christmas Related Books - Introducing Christmas to my 3 y.o. 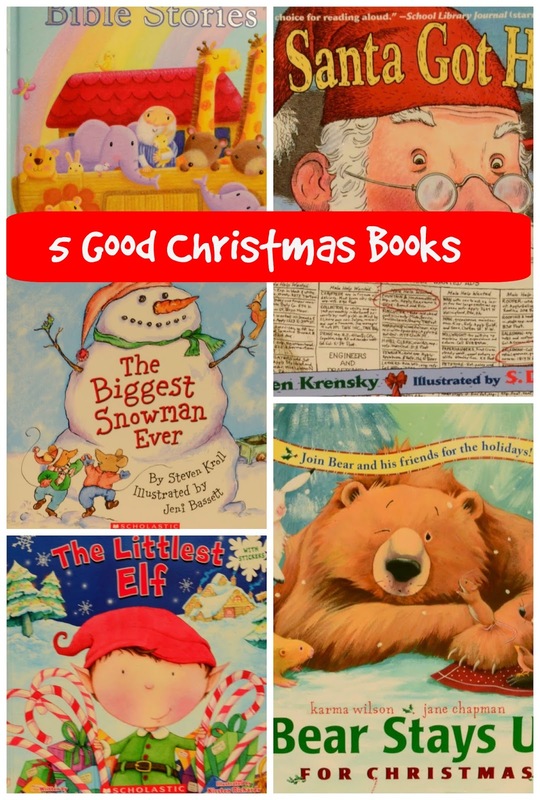 5 Good Christmas Related Books - Introducing Christmas to my 3 y.o. As this is the first time I'm reading Christmas related books to my 3 y.o. son, each one is taking longer than usual. I'd to explain everything from the concept of Santa, Stockings, Elves, Flying Reindeer, why Rudolph's nose is relevant, and also concepts like Hibernation, Chimneys, & introduction to animals such as Gopher, Badger & Mole! It begins with a young Santa, who hopped from one job to another: cleaned chimneys, delivered mail at night, was a zoo-keeper, joined a Circus with his Reindeer friends and met the elves who made toys. He then combined his skills, friendships and his joy of giving to deliver toys on Christmas Eve. A cute story on the evolution of The Santa! I LOVED it the first time I read it and so did my kid, although I did feel it was a bit complex for a 3 y.o. who is just being introduced to the concept of Santa. But like I said, it only takes longer to read. Brace yourself for a LOT of questions! This is his *favorite*! The Bear's friends, the mouse, raven, wren, gopher, mole, badger wake him up to celebrate Christmas. They get a tree from the grove, pack gifts, pop corn to decorate the tree etc. I touched upon the concept of hibernation, "like we sleep ALL night, bears sleep ALL WINTER! so he needs all the help to stay awake for Christmas Eve!".. then briefly the friends fall off to sleep (while the bear packs their presents for their Christmas morning surprise) and my 3 y.o. was like "They came to wake him up... then why did they go off to sleep themselves?!" This is the only book about to why the world celebrates Christmas! I had bought this long ago in Jakarta (It's avail here too), although it says "baby's first" I cannot imagine telling a long one page story with only 1 illustration to a baby! Probably appropriate for kids who are at least 2 years old. This has 12 stories, including Adam and Eve, Noah and the Ark, Baby Moses, David and the Giant, Birth of baby Jesus, The Wise Men. There's a biggest snowman contest in town where two mouse friends compete against each other. They eventually join hands and make the biggest snowman together! It's a simple story on friendship. Oliver is the littlest elf in the North Pole, too little to work in the toy shops and Dot is the littlest Reindeer, too little to fly! Together they find a found a special job to spread Christmas cheer! The above 5 books (along with Rudolph the Red-Nosed Reindeer by Random House) cover the basics though, so I guess we are good for this year. But if you have any more suggestions I'm eager to know! I have never heard of these books. Looking forward to checking some out. Pinning It! This seems like a good selection of books, covering all the aspects of Christmas. Have fun reading to your 3 year old, the time will fly all too quickly. I love having Christmas books for the grands to look at and read. Thanks for sharing these with Creating Christmas. We LOVE How Santa Got His Job and Bear stays up for Christmas-- we've read them a few times. Thank you for sharing this post with us at What to Read Wednesday. These are fun choices! Your link was the most clicked from last week's link up and will be featured this week. I hope you'll join us again!